The machine speed range can be from 60 bottles per minute up to 2,400 cans per minute. 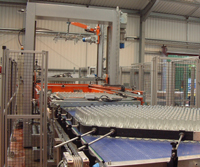 High level glass depalletising at 600 bottles per minute on pallets 2,800 mm high with automatic inverted tray, flat board and wooden top frame removal system handling both Chep and Euro pallets and linked with the palletise unit to reduce pallet handling. The tall pallet for the glass reduced transport cost and reduce the carbon footprint. Low level sweep off depalletiser for tapered glass jars with stabilising pins. Combined de and re palletisers can be supplied with a single head and table where they are used for bright can buffering for instance or on empty PET bottle feed to a filler. Additionally Enterprise supply a modern debagger for the dairy industry. 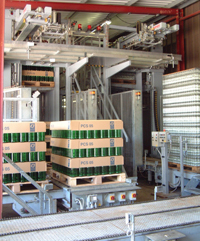 The debagger incorporates the latest technology for soft handling of polybottles and has a variety of accessories for varying levels of automation. The depalletiser can be supplied with the associated empty product conveyor system or as part of the complete line supplied from Enterprise Tondelli. This gives an integrated project solution thus freeing the customer to concentrate on running a production facility.